Islamabad (Pakistan), Aug 31 (ANI): Advertisements for jobs usually bring excitement. But an advertisement for recruitment by the PakistanRangers has created the furor in Pakistan. An advertisement carried by a leading daily recently drew flak for marginalizing the minority communities in the country and reserving the lowest strata of jobs for them, which reflected the country’s approach towards these communities. 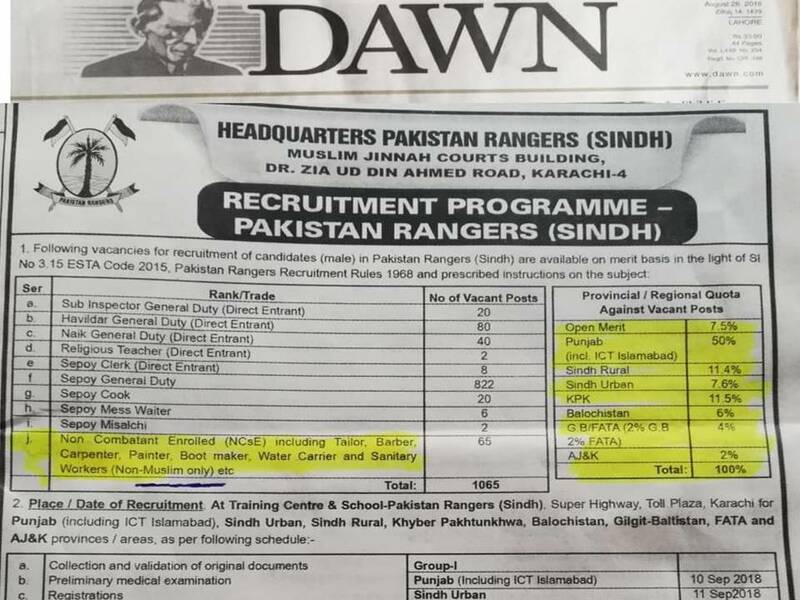 The Pakistan Rangers (Sindh) on August 26, 2018, issued advertisement in daily Dawn for several posts. However, it was the specifications mentioned against the vacancies of sweepers and sanitary workers that caught the attention of the people more than others. The advertisement clearly specified that these jobs were for `Non-Muslims’ only. The advertisement has hurt the sentiments of the minorities in Pakistan who criticised the newspaper for carrying a racist and inhuman material. “The paper founded by Jinnah carries a racist and inhuman advert which says that the criteria for the job of a sweeper/sanitary workers in Pakistan are just you should be “NON-MUSLIM ONLY”. Highly shameful that papers carry such filth to make a few thousand Rupees #PakistaniMedia,” Pakistan Media Watch tweeted. Christians, Hindus, Ahmadis, Scheduled Castes and others (including Sikhs and Parsis) are officially recognized as religious minorities in Pakistan. According to the 2017 Census in Pakistan, Christians account for 1.59 percent of the population, while Hindus account for 1.60 percent, Qadiani (Ahmadi) make up 0.22 percent and Scheduled Castes 0.25 percent. Several cases of discrimination of people on the grounds of religion have been reported from Pakistan. For instance, on June 13, the minority Sikh community in Peshawar, Pakistan, was moving to other parts of the country following repeated attacks by Islamic fundamentalists. More than sixty percent of Peshawar’s 30,000 Sikhs had left for other parts of Pakistan or migrated to India after being forced to live under a constant threat. On May 12, the Chief Justice of Pakistan, Mian Saqib Nisar, himself condemned the targeted attacks on members of the minority Hazara community in Balochistan, and described it as a clear case of “ethnic cleansing”. Less than a week ago, agitated members of the Hindu community from various parts of Hyderabad held a sit-in protest against the encroachment of their cremation site by influential figures and the police. IN PAKISTAN A HUMAN LIFE IS MUCH CHEAPER THAN A CUP OF WATER!